This is so ridiculous I don't even know how to formulate my frustration. I appreciate that states are trying to find a way to evaluate special education teachers without using the same standardized tests on children with disabilities. However, Florida's decision to compare children with like disabilities is a bit much. It's a wonderful reminder of how the people making policy decisions are not the ones in the classroom working in reality. All children are different but our children with disabilities are each unique and in many ways probably have more in common with typically developing children than others who happen to share their special education label. Just because two children happen to have tested as having a similar IQ or happen to have an educational diagnosis of an Intellectual Disability does not mean that they are going to have the same learning rates and progress. I know states want to find the best method to measure special education teachers, but I don't see why what happens now doesn't work. Currently we take base line data on each student and then work our rear ends off to improve that baseline data and meet the individualized IEP goals. 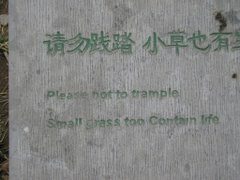 That's just a bit difficult for a state to measure. The reason we write IEP goals is because the students require an Individualized Program. If they were similar we would be able to take the I out of IEP and just have an "autism" plan or a "Intellectual Disability" plan. We've been working on identifying same and different with one of my students with an intellectual disability all year but the progress has been slow. It's a surprisingly hard concept to teach. It's not something you can necessarily break down into little steps- it is more of a concept that the brain grasps once it has been exposed to it enough times. We sorted and matched and sorted and matched and compared and discussed daily. Suddenly last week he began seeing how everything was the same. He was constantly driving his chair around the room telling me, "the same", and making the sign for same. He was comparing everything- words in our classroom, colors, pictures, smiles. All day long, all the time. And just like that, the connection was made. Once he was able to understand that the 'we' we read everyday in the morning message is the same two letter word on our word wall and the same word in other places in the room he began to be able to identify the word 'we' in other places. Before last week his progress in our reading program, Early Literacy Skills Builder, was very slow. We were repeating every lesson over and over again, aiming for 75% accuracy. Then suddenly he made the connection that things are the same- concepts in the story are the same as the questions I ask- the answers are the same as what is in the story. Words are the same on cards as they are in the book. Letters make the same sound each time- even if they are on the word wall, in some one's name, or in a book (OK, they don't, but we're not ready to get into that yet. /r/ is /r/ is /r/. Leave it at that). I had never thought about what an important concept same and different is for building a foundation for general reasoning, literacy and math skills. Until our students understand same/different they are not ready to begin to read because they don't understand that letters are the same no matter where they are and that they hold the same meaning whenever they are. Otherwise they are just pictures that we float around the room as we give them arbitrary meaning. Of course in order to begin to understand same/different and how it works in literacy they need to be exposed to as much print and literature as possible, so learning this concept shouldn't hold anyone back from teaching reading. It should just remind us the importance of working on those foundational skills. It's been amazing to watch him begin to soak in the learning environment around him. I'm excited to see him continue to grow now that this foundation is in place. Earlier this year I wrote about how I've added real objects to my retelling center. It has gone fabulously well. I've seen children use language unprompted to retell our familiar stories- language I did not think they had in them. It has gone so well that I want to continue doing it with all of our stories but I'm running into problems finding the materials for all of them. I've set up a donors choose page to help fund some of the materials- toy animals that we can use for many different stories and a dragon and a castle to help retell fairy tales. The speech language pathologist, the librarian and I plan to take this project even further by using voice threads and photo stories to continue to encourage their use of language in telling narratives. Research I read recently discussed how the ability to tell a narrative is essential in all aspects of language development. Our hope is that this project will scaffold our students into telling narratives and give them a firm base of language development. Stay tuned- more on this later! 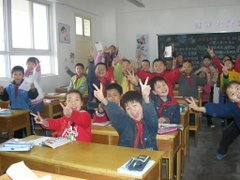 All things considered Friday was a great day in my classroom- most of the kids are making awesome progress. Things are clicking and I'm excited to watch them soak in knowledge. Of course, no day can be exceptionally perfect and one of my little friends was having a rather difficult go of it. She only had two rough incidents but they took it all out of me.I went home exhausted and overwhelmed. It wasn't until today that I realized so much of my exhaustion is from my new priorities of being a working mom. If Friday afternoon's incidents had happened last year I would have spent Friday after school laughing about it, calling parents, making a list of everything I needed to do, reflecting and developing a plan for Monday. This year, as a mom, all I could think of was "Day care is closing early today- I somehow have to get out of here as soon as possible." Being torn between the two worlds is physically painful. I knew the situation needed more of my time. I love those kids to death and I want to do my job the way I know it should be done. I want to re-read books on bevavior, I want to examine what happened, write about it, look for ways I could handle it better, and reflect, reflect, reflect. I need to do that to be able to come in ready for Monday. Yet all I wanted to do was get to my daughter, not upset my daycare provider by being late, and get my daughter on the floor because oh my goodness she is going to crawl any day now. I ran out of school and sure enough showed up at day care to see only my daughter. The other parents had been on time. The guilt I felt while my beautiful baby gave me her huge "Thanks for coming mommy!" smile killed me. Yet even as I sat with her Friday afternoon, cuddling and encouraging her new skills all I could think about was my kids at school and the irruption that had occured.I feel like I can never just be anymore. Guilt is seems to sneak around after me, mocking my desire to do any one thing really well. But even if I was a stay at home mom I'm sure the guilt would still haunt me- guilt for not doing laundry or cleaning the dishes on time- guilt for missing my job. Is being a mom just one large guilt study abroad? Forget guilt trip- this is an intensive, long-term experience. And of course sitting in church today I could think of nothing but my baby at home and my babies at school- which one should I focus on when I should really be listening to the sermon? Forget feeling guilty about zoning out in church- now I feel guilty for not day dreaming about the right things. The thing is, most of the time I love my job and I love being a mom, and really, I love doing both things. It kills me to have to drop her off at daycare when she's in a great mood knowing that by the time I see her in the afternoon she'll be tired and fussy. I am missing the best times of her day and that is too painful to even think about. But I know she is in good hands and I love getting to work with my students. I think I just have to swallow the fact that right now guilt is a reality, welcome it into my life and then tell it that while it can visit it needs to be a good house guest and clean up after itself and stay in the guest room so that it does not take over my life. One of my co-workers had given me a cute center that required the kids to put a clothes pin over the correct answer out of three choices on an index card. I immedietely put it to use, but unfortunately my kiddos do not have the fine motor skills yet to open up the clothes pin and attach it to the correct number. I ended up with a lot of frustrated little ones. Instead I used wik-sticks. I made a bunch of circles out of wiki-sticks and took large index cards. 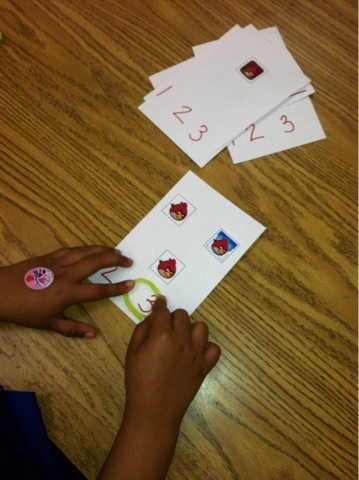 I put stickers on the cards or for Brown Bear I glued down pictures of angry birds. 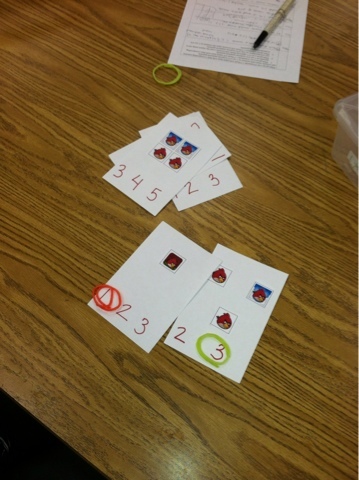 The kids can independently count how many stickers/pictures are on the card and put the wiki-sticks over the correct answer. You could use this for anything- one picture and 2 or 3 choices of the initial sound, 2 or 3 pictures with a rhyming word, etc. Super easy and super independent. On the way to work yesterday I heard a short story on NPR about Poem In Your Pocket Day and promised myself that I would do something to celebrate. Kinders and firsties LOVE having things in their pockets and I loved the idea of giving them a poem to carry around. I sent a frantic email to the librarian asking for good short poems. I threw something together, copied a short Robert Louise Stevenson poem about rain since that seemed fitting, and was going to call it a day. When I went to meet their class later I saw that Rock Star was not the only one with a new felt pocket. Almost all the children in her class had their own poem pockets safety pinned to their shirts. They'd also decorated their fabulous pockets with their favorite things. They were oh-so-proudly patting their pockets and grinning about their special poems. It was awesome. They even made one for our librarian. It was a very special last minute kind of day. Next year when we actually have time to plan for poem-in-your-pocket day I can't wait to see what we come up with! "Hey, Rock Star- I'm writing you a letter, OK?" called out one of my girls as she frantically wrote on the stationary sitting in the dramatic play center. Rock Star, ever the practical one, said, "Why?" "Because... because... It's I love you day! Now, come get your card, right now!" I was completely stuck with one of my kids. I felt like I was doing EVERYTHING I knew how to do to help this kiddo write. No matter what I did I just could't get him to say a word slowly and correctly record the sounds he heard. He'd say the word slowly, isolate the sound and then write "Q" and go on to the next word. He can spell high frequency words out loud but when it comes to writing them on paper he'll write "Q" and move on. I pulled out every trick I knew and I still couldn't get him to independently hear and record sounds in words. He can write a great story but I need to be with him at every step of the way prompting him to stay on task, say the word, listen to the sound, and write the letter he heard. Or so I thought. I finally requested to be coached. I LOVE that my school has literacy coaches we can go to when we are stuck. When I first started teaching I found it intimidating- I mistook coaching for judging. Now as an experienced teacher I feel like I begging to be coached. "Please, come watch me! I know something isn't working and I need help figuring out what it is." Last year I video taped myself once to try to figure out what I was doing wrong but it wasn't the same as getting feedback from someone observing you. They can pick up on elements of the lesson you may not have noticed, or can point out missed opportunities you may never have thought of. Once you get over the "they'll learn I'm a bad teacher and judge me" coaching is really an amazing opportunity. (But it took me years to get over that feeling...) The literacy coach came in to observe and wrote down everything I was saying. Turns out I was saying a lot. I knew that- I was frustrated with how much support I was giving him but I don't think I realized it was four legal size pages worth. She suggested that I stand back and change my prompts from entire sentences to phrases, and then eventually from phrases to a single word and from a single word to a look. Basically I need to stop micromanaging his writing and start letting him take ownership of the writing while still reminding him that I am there and keeping him on task. So today I took a deep breath and dived into a writing conference with him where I would not talk everytime I wanted to. I even kept a tally on my notes page of how many times I prompted him just to remind myself to STOP TALKING. And miracles of miracles- he could do it without me. Sometimes a look was all he needed from me and then he'd say the word slowly and write it down. He hadn't been working before because I had been doing the work for him. And my micro-managing him was just encouraging him to be passive and wait for me to tell him what to do next. He wasn't ready for me to walk away and leave him to be completely independent (that quickly can disolve into drawing on the table) but he is ready for me to change my prompts. It was so simple yet so powerful. I just needed to back off. I am so thankful that I had the opportunity to be coached and that the coach was so insightful. And I'll go ahead and pat myself on the back- I'm glad I've gotten past the point of being worried about being judged and I feel comfortable asking for coaching. It's freeing and I love the results. A few weeks ago I was reminded of one Responsive Classroom recommendation- that instead of displaying the work that you the teacher decide to display instead you should display the work that the students want to display. When this was mentioned I kind of remembered learning about it, thinking it was a great idea, and then never thinking about it again. It is something so simple, and yet something that calls for a massive teacher mind shift- stop planning cute murals or art displays that show all the same work. Instead create a space in the classroom where students can display the work they are proud of. Something so simple but so powerful. Instead of putting up one art project that usually shows how creative you are as a teacher (even if we don't want to admit it that is what we're thinking when we put up our art displays- right?) send the message to the children that when they are proud of something they can choose to display it. It means not thinking of cute and witty titles for bulletin boards but instead giving control over to the students- letting them decide what is display worthy. I happened to have already hung a string up in the classroom with clothes pins. It had previously been displaying all the same work- whatever art project I decided would add enough color to the room. The next time we did an art project I asked the kids whether or not they wanted to put up the new project and take down the old one. Then the next week I did it again. Everyone decided something different. Some kids didn't seem to understand or care but I went through the motions of the choice anyway. After doing it twice I started to notice something. They WERE thinking about whether or not they wanted their work displayed. They were putting more effort into their work because it if was good they would use it to decorate OUR classroom. 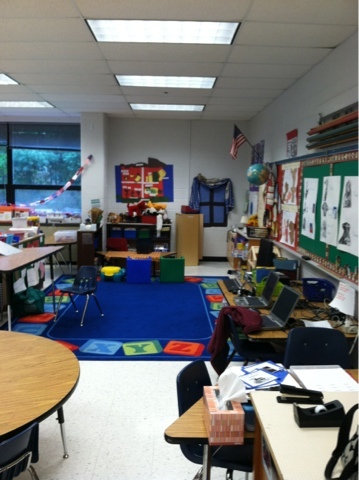 Not my classroom- but theirs. One little boy started asking me to put up some of his other drawings. Not all of them, but occasionally he'd show me a drawing he'd worked hard on and ask me to put it up. It is so simple- we're doing the same activities anyway, I just need to release control and allow myself to be ok with not putting up everyone's adorable work. Then I just need to give myself time during the day to quickly ask each child if they would want their art displayed or not. Of course I have other murals and bulletin boards that do show the assigned art projects. But for right now I'm enjoying my clothes line of work we're proud of. (Currently displayed: leprechauns, city scenes with buildings in order from longest to shortest, and one poster of what a child will look like when he is 100). Good thing our students are being assessed with such fabulous testing tools. And that teachers whose students do poorly on such tests will be punished. I'm glad that I work so hard to produce young readers so that their reading and comprehension abilities will be assessed in this way. I feel better about our country's education system, don't you? Our main meeting area is off to one side of the room. 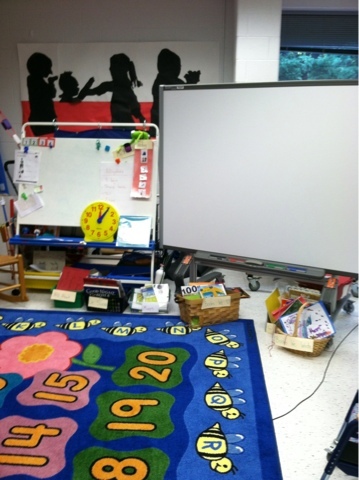 We have our easel and our smartboard at our fingertips beside our calendar. Under the easel and the smartboard are our baskets of books that highlight what we are studying- books we wrote, books about emotions, books about maps, books about the zoo, books we just LOVE and can't get enough of. I like having the highlighted baskets in the meeting area because it makes it easy for me to refer to them when I am teaching, but also serves as a constant visual reminder for the students on the different sorts of books. Our classroom library is sorted (not well- one of those things I let go this year with maternity leave) but the children do not always use it thoughtfully. On the carpet I see them making choices about what basket to go to based on what they want to read or know. 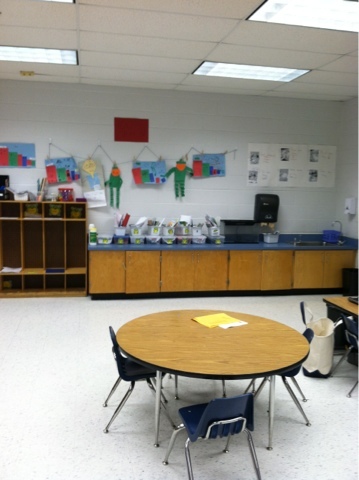 The word wall is also right beside our meeting area so we can constantly use it when we are doing interactive writing. We do word wall activities daily- either singing alphabet songs (LOVE, love, love Dr Jean's 'Who let the letters out?') or word wall cheers. Underneath our word wall are posters of what we do in our classroom. They are not our rules so much- those are posted in another area of the room and were created when I was on maternity leave. I took pictures of the students showing us how to sit quietly, put their hands in their laps, walk safely, share, and listen to the teacher. Each picture is posted on a piece of construction paper under the word wall. I am trying to be better about using these posters as reminders of how we behave every day. During morning meeting my goal everyday (and sometimes I just forget...) is to read the reminders together with the students. Then each student decides what they want to work on that day- do they want to try to sit with their hands in their lap, do they want to make a goal of sharing, of listening, or of walking safely? They put a sticky note with their name on it on their poster. At the end of the day (if I 1. remember and 2. have the time) we talk about how their goals went- did they sit quietly, did they keep their hands in their lap, etc. I like that it lets us focus on just ONE behavior a day . During the reflection time one of my kids may have had a rough day but he can at least say, "my goal was to keep my hands in my lap and I did that." It is a good reminder to me to find the positive even on our most difficult days. Sure you threw your pants in the toilet, but you know what- you did walk safely. Thank you for that. Sometimes I ask them to identify what they did well that day from our posters as a way to get them to reflect on their behaviors. Some of them are not ready to grasp the larger intangible concept of setting a goal and trying to meet it, but the conversations allow us to repeat the language of the expected behaviors over and over again. The more we talk about those expected behaviors the more likely we are to see it. Please bear with me- I am writing on my ipad while Baby Lipstick is napping and am having some trouble making the pictures and the text match (something my students struggle with daily...) Blogger hasn't developed a good ipad ap yet (that I know of- if you know differently please tell me your secrets!) and I'm trying to blog, get laundry done, put away the dishes and do all those other household chores while my nap-hating baby takes one of her cat naps. So my pictures and my writing may be in two different posts until I have time to make it all work together. Which may be never, but that is ok. I have the most amazing room this year. 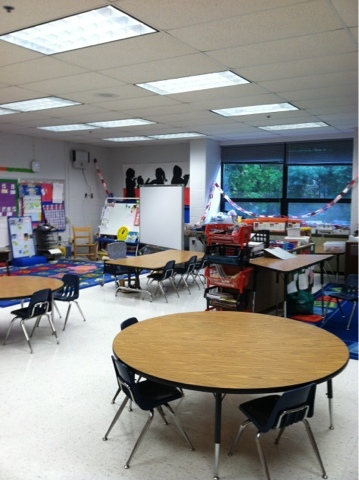 Every morning when I walk in the door I silently thank my administrators for assigning me such a perfect space for my classroom. Then I silently thank them again when one of my kids is having a massive melt down on one side of the room and the other children are still able to happily work away at their seats. I silently thank them again when the occupational therapist does an amazing singing lesson with the kids she works with and I am still able to get in guided reading with my reading group and no one is distracted. I silently thank them again when one of my students is being transitioned from his wheel chair to his stander, matt, or specialized chair because it allows him to have privacy for the difficult transitions without the whole class staring at him in curiousity. The space of my room is 100% ideal. My students are barely bothered when I have student in the bathroom with the door open as we coach him through changing his own diaper. The room is that large. It is amazing. 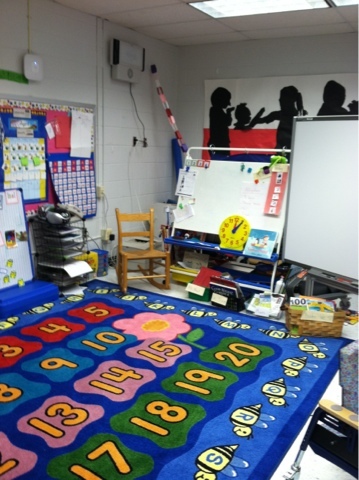 Special Education HEAVEN. I have enough tables to spread everyone out at different working locations so they can work without distracting each other, but big enough tables so that we can all sit together for other activities and work on our social skills. I have two carpets for two meeting areas if needed.Please know that when I snapped these pictures I did nothing to straighten up the room- it is in its state of organized chaos- posters falling off the walls, baskets askew from being used and put back by five year olds- not perfection but a reflection of our daily lives. 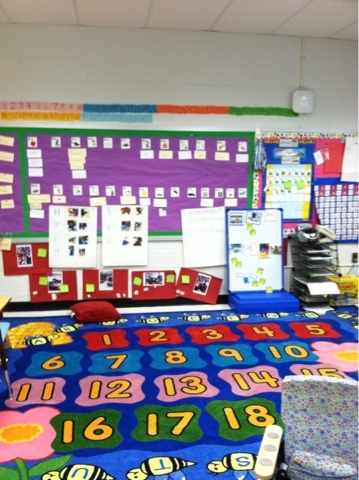 I'm going to try to walk through the parts of the room if I can get the pictures/words to show up on the same post... If not, I'll post pictures now and then add descriptions later. I am also not checking for spelling/grammar/typos at the moment- please forgive that too. Every year my school has a writing celebration called I Heart Writing. We make a huge deal over our little authors, praise their hard work, celebrate their published pieces and discuss the writing process. It is one of my favorite days all year. I love how excited the children are to share their work and I love their pride in their published pieces. This year, however, I was a bit worried about how it would go. I have some children who are able to write books, even if it is just drawing pictures of one topic. Three of my children do not write or even draw. How were we going to come up with a published piece for them to share? After a lot of watching and observing what they can do as writers I did something a little different with each one. I had Brown Bear use the doll house to retell Goldilocks and the Three Bears. Of course he added his Angry Bird doll in as well. While he acted out the story I took pictures of each scene. We printed the pictures and had him put them in order. Then I printed out the words "goldilocks"' "baby bear" and other key nouns and had him label the pictures- working on his understanding that print contains meaning. On I Heart Writing day he could show us the pictures and tell us the story, pointing to the labels to "read" his work. It wasn't I writing, but it was a composed story that he told in sequential order. It stayed the same every time and the words contained meaning. And it was a pretty good book to read too. For another one of my students I had little tiny cut out bears. He glued these to different pages and narrated what the bears were doing to me. I typed out his words and let him glue the sentences down on the page. He too was able to begin to understand the concept of a story- that it is the same every time and the pictures and words match. Magical was able to draw a bit of his story although no one but Magical would know what it was. His sentences were simple, "Mom is resting", "mom is shopping". I typed the three word sentences out for him and then cut them up. Magical had to read the three words, put them in order so they made his sentence, and then glue them down. In the end he had a book he could read that he had composed himself. Clearly I have a long term goal that these little ones will write their own compositions one day. But for right now we were able to find a way to celebrate where they are by publishing books just like every one else. The celebration was a huge hit and they we're all super proud of their work. Now it's time to take that pride and turn it into motivation to work hard on our next published piece! I am a professional. I am not six. I take my job seriously. I don't need attention grabbers. I believe what I do is important and I want to do well at it. I do not need little zebras dancing on the pages of my teacher's manual encouraging me to work hard. I don't see dancing cartoon animals in the margins of accounting books, or medical reference books, or law reviews. Why do we do this to ourselves? Why do we treat ourselves like we are the kids we teach? I just bit a substitute's head off because she said she was going into teaching because it was easy and that she didn't understand why she just couldn't take a test to become a teacher. This makes me proud of our profession. So some scientists have been putting a lot of thought into getting rid of lice and they finally found something that works- and not just works but kills the eggs. Elementary teachers everywhere are crying with happiness and relief. Now we just need to get our hands on one of these contraptions. I'd like to write a grant for my school to purchase one of these machines so that our kids will stop missing school because of these awful bugs. There has got to be a correlation between test scores and lice... Kill the lice, raise the scores, right? God's gift to teachers is when April Fools Day falls on a weekend.